Wow… A Series Relaunch… Again? How has Marvel continued along the same path for years now without keeping in mind that readers are going to tire of all the ridiculousness. What am I talking about exactly? Well, Marvel is re-launching the Hulk title… again. Since the events of Planet Hulk (and including the Red Hulk series which served as the sole Hulk title at the time) the Hulk has been re-numbered and re-launched four times. FOUR TIMES! Since 2008. That’s four times in 7 years. While it should be something that most people over look I may take this time to stop collecting. Stop reading. I have read the Hulk every month since 1991. 23 years of my life has been dedicated to the jade giant – and yet this type of business practice is truly getting to me. I maybe done. 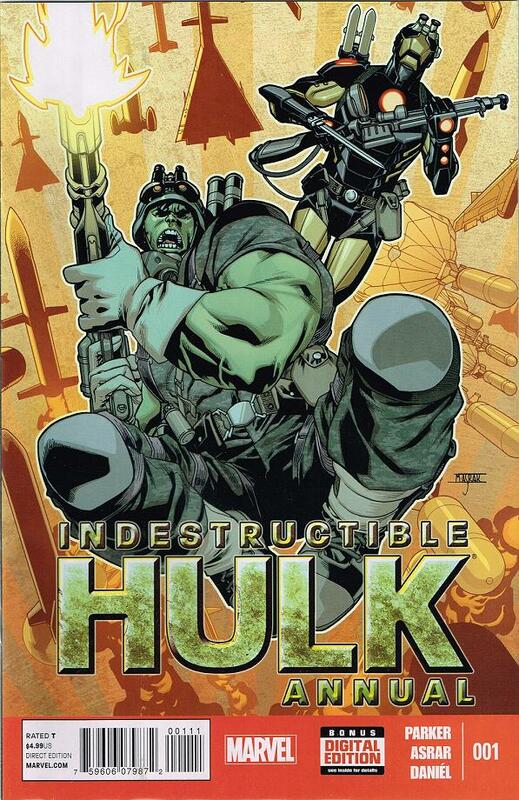 We still have a few issues of the Indestructible Hulk to go. Let’s see how they wrap up this series. Click on the image for the link. Marvel has been getting ideas from their readers for years – like, in Secret Wars, that new Spidey costume was actually designed by a 12 year old boy in a contest they were holding. Well, it turns out Marvel might have done this before – but this time not given the credit where it was due! Click the pic above to be brought to the story – and the pic below for the follow up! Catching Up Thursdays – and Happy New Year! Parker has a real knack for writing interesting and fun stories that intertwine perfectly with continuity. History is as important to the fan boy as costume preciseness and power accuracy – a fact that some new writers (and even a few veterans) miss out on. That being said, I am still not sure where to place The Indestructible Hulk. I mean, I know he has the where with all of decimating city blocks and destroying small towns as the Hulk – fighting heroes over the year – being shot into space, etc. But which parts of history should remain – and what is being asked to be forgotten? Here we have Stark and Banner tracking down an old Professor named Zadian who has an entire island that he has turned into a living, breathing weapon. Everything is susceptible to destroying anything that he views as his enemy – including his former students – everything including the sand on the beach and the air that they breathe. Watching Stark and Banner’s personalities bounce off each other, seeing them prodding each other over who has the superior intellect, is like watching old friends banter over long standing feuds about ex-girlfriends. The only thing that bothers me, still to this day, is how Banner (and the Hulk, for that matter) don’t mention Stark’s part in the idea to shoot the Hulk into space. We can all see that they had plenty of chances in the chattering amidst the two about “turning space travel into a weapon”. Over all though, watching Banner and Stark facing a foe who can match, and sometimes defeat, their mental prowess was a real thrill. Overall, Parker shows that he could be handling the Hulk’s monthlies without a problem. 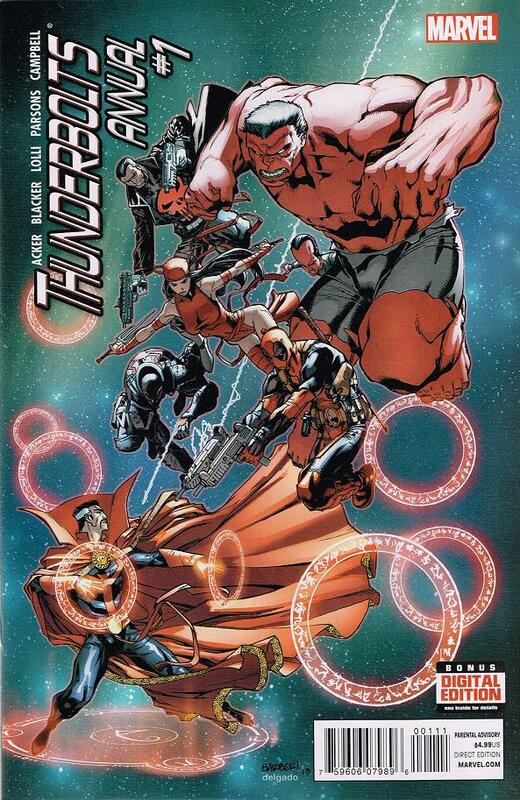 Not sure why this didn’t hit me right away – I think I will chalk it up to the fact that I just don’t pay attention sometimes – but I found it pretty hilarious when I linked the fact that this new version of the Thunderbolts are called that because they are lead by… General “Thunderbolt” Ross. Again, I know that I am probably really late to the party on this one but I still found it funny. So, I wish this Annual was just as fun and entertaining as the regular series but I am sorry to report that this issue, which features the team collecting mystical items to battle a troll posing as Dr. Strange, falls pretty flat. The only real joy was the somewhat predictable ending where Castle saves the day when he can’t be cheered up. It’s still worth the read if you’re following the series – but don’t let this be your first exposure to the usually more entertaining team.